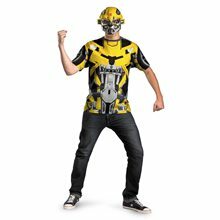 Bumblebee Movie Deluxe Adult Costume.Age Category - Adults.Brand - Transformers: Revenge of the Fallen.Character/Theme - Alien & Monster , Hero & Villain.Includes: Jumpsuit, mask and sculpted chest piece.Available Size: Mens (42-46). (See Size Chart For More Information)Material: Jumpsuit - 100% Polyester, Mask - PVC.Care Instructions: Hand Wash Cold, Separately. Do Not Bleach. Line Dry. Cool Iron If Necessary. Do Not Dry Clean.HASBRO and its logo, TRANSFORMERS and all related characters are trademarks of Hasbro and are used with permission. © 2008 Hasbro. All Rights Reserved. © 2008 DreamWorks, LLC and Paramount Pictures Corporation. All Rights Reserved. Transformers Bumblebee Dress Adult Costume.Includes: Dress, headpiece, petticoat, glovettes and leg covers. Available Size: Womens - Small (4-6), Womens - Medium (8-10), Womens - Large (10-12). (See Size Chart For More Information) *Shoes Not Included. Accessories Sold Separately. Halloween is your chance to show your fun side. 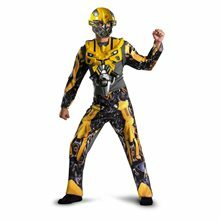 Let it shine through for everyone to see with the Transformers Bumblebee Sassy Deluxe Women's Costume. Don't forget to check out our Halloween shop for all the accessories, props, outfits, and decorations you'll need for a hauntingly fun Halloween. Includes dress, headpiece, petticoat, glovettes, and leg covers. 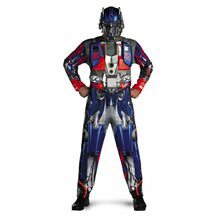 Does not include shoes.This is an officially licensed Transformers: Revenge of The Fallen costume. 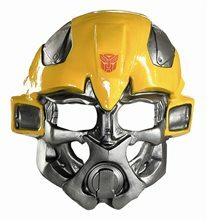 Transformers Bumblebee Mask.Includes: One Transformers Bumblebee Mask. Available Size: One Size Fits Most Adults and Teens. *Costume and Accessories Not Included. Sold Separately. A humble and helpful autobot. Transformers 3 Dark Of The Moon Movie - Bumblebee Vacuform Mask features a polished vinyl finish and intricate robotic features to replicate the look seen in the feature films.This is an officially licensed Transformers: Dark of The Moon product.